Abuse and neglect are two of the major reasons why young people leave home. Several studies show that nearly 70% of homeless youth have experienced some form of sexual, physical or emotional abuse. Why Do Youth Become Homeless? Youth often become homeless because of abuse. They are more likely to have experienced violence or sexual assault then the general population. Homeless youth are more likely to have multiple risk factors including mental health problems, addictions, behavior or learning disabilities. Homeless youth seek shelter in vacant buildings, stairwells, alleys, parks… anywhere they can become invisible. Homeless youth are more likely to die younger than their peers. Isn’t This Just A Big City Problem? No! Based on our population, it’s estimated there are over 100 homeless youth in Perth County right now. In 2017, we served 152 youth directly through LOFY. We supported 69 at-risk youth with shelter through our ‘Prevention of Homelessness’ outreach program. Shelterlink also fielded 3,500 emails/phone calls, many of which became referrals to other social service agencies. Every community in Canada has homeless people, including Stratford and Perth County… even if you don’t see them on the street. Most homeless people don’t live on the street. More than 80% of Canada’s homeless are improperly housed or on the verge of eviction. Many are sleeping in temporary beds – with friends or relatives, in church basements, in welfare motels, in abandoned buildings and vehicles, and in other sites away from the public eye. The person you see on the street is just the tip of the iceberg. The long-term or “chronically” homeless person – the individuals we tend to see on our streets – represent less than 20% of the homeless population. The rest are families and individuals who find themselves without a place to live for a period of time. Our young people also make up the hidden homeless. Many homeless youth are living in shelters or bunking with friends – many are fleeing abusive situations. About one-in-seven users of shelters across Canada is a child. Compared to children with permanent homes, homeless children suffer more from lack of educational opportunities, infection, obesity, anemia, injuries, burns, developmental delays and incomplete immunization; youth suffer more injuries, sexually transmitted diseases, mental health problems, and pregnancies. As women generally earn less than men, women are more vulnerable to becoming homeless. Newcomers to the rental housing market, especially young people, immigrants and refugees, are often required to rent housing that they cannot afford. They are often one paycheck away from eviction. Many seniors face eviction due to fixed incomes and increased rents and taxes. Ensuring seniors stay adequately and appropriately housed prevents them from being part of the hidden homeless and ending up visibly homeless or in hospitals. The working poor, often single parents with young children, end up living in crowded housing as they are unable to afford a decent place to live while feeding and clothing their children. 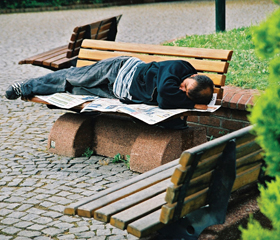 The hidden homeless are at risk of long-term physical and emotional harm. The longer anyone remains homeless, the greater the social and economic costs.